After earning her degree in art education from Purdue University, Jan M. Saunders embarked on a wide-ranging artistic career that took her all over the country and led her to launch JMS Artistic Dimensions in 1985. By 1997 she was settling in Northeast Ohio and decided to focus all her company’s energies on her unyielding passion to create beautiful murals, and more, that delight her clients. Jan brings a space to life with her custom designed murals, faux finishes, trompe l’oeil illusion, hand painted furniture and hand-scripted quotes on walls. Because of her phenomenal ‘eye for color’ and ability to connect with her clients, Jan is able to create works of art, in many styles, that “speak” to her clients and make each space memorable to those that enter. There’s no limit to the possibilities of what can be created on a wall or piece of furniture. A vibrant image can change the dynamics of a space and bring with it an energy and a story. 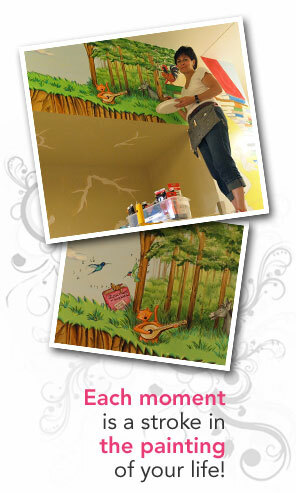 A mural is interactive, can expand a space, and stir the imagination. Faux finishes can create warmth, texture, and accent furnishings. In a business setting a mural, wall treatment or decorative painting can help compliment and sell a product. Jan is creating beautiful spaces throughout Cleveland, Northeast Ohio, the Midwest and beyond. Let her show you the possibilities for your home or work space! It all starts with an idea!…..Jan wants to hear your ideas and she has lots of her own to share with you!